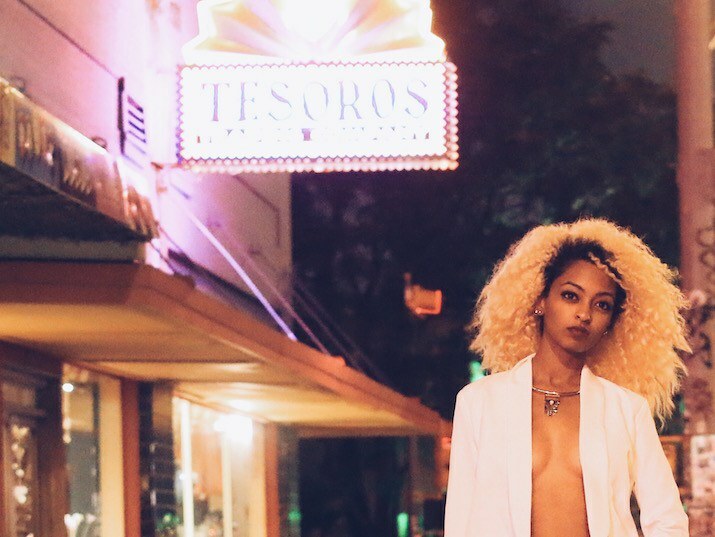 Austin-based Ethiopian singer Mélat premieres a collaboration with Obey City and speaks about her Ethiopian-influenced electronic pop songs. The Austin-based singer-songwriter Mélat crafts seductive tracks that merge pop sounds with Ethiopian influences. In her new release, the It Happens So Fast EP, she sings silkily over hip-hop beats and hazy electronic instrumentals produced by the likes of Jansport J, Robbie Anthem, and frequent collaborator Pha The Phenom. Okayafrica: Can you tell us about your Ethiopian background? Mélat: I’m a first generation Ethiopian-American. My parents immigrated to the US in the 80s and, though I was born and raised in Texas, my parents always made it a point to instill the culture and language in our household. They wouldn’t speak or respond to me unless I was speaking Amharic, which in hindsight, I’m so thankful for because I’m still fluent in the language today. I still have many family members and “extended family members”—those family members who are not really family, but you’re still told “oh this is your uncle!” but he’s the neighbor’s kid with whom your dad grew up with 30 years ago. I love it!—who still live here and all across Ethiopia. I had the opportunity to visit Ethiopia and see Addis Abeba—where my mom is from— and my dad’s hometown of Sidamo for the first time in 2010. It literally changed my life. I have a picture of my grandfather with Haile Selassie I that I cherish, so finally getting a chance to see the real-life beauty of the country was surreal for me. I can’t wait for the next time I get to return back home and hopefully perform. What would you say are the Ethiopian influences on your songs? There's a strong sense of pride in every piece I write. A beautiful pride in who you are and your heritage is instilled in each and every Habesha from birth. That same pride manifests in my writing and my approach to topics like love, life, and the world. The music is very melodic, which may explain my love for melodies and harmonies. Also, the lyrics of the songs have a deep emotional root. All of my favorite Ethiopian songs really strum at the heartstrings and tell beautiful stories, I aim to do the same with my music. I want to create something inviting that touches the soul. Tell us about "Dance Olivia." What inspired the song? Obey City sent the original version of the beat while I was driving to LA from Austin with [producer] Pha The Phenom on the same day I dropped the Move Me EP. As soon as I heard it, I loved the off-tilt nature of the beat. Obey City’s sounds just clicked with me, there’s something about sonic courage and newness that just wins me over and Obey City brings that to the table. While in LA I was watching what I think was a Rock and Roll Hall of Fame concert and was inspired by the bounding notes some of these 80s rock stars were hitting. Once I got back to Austin I knew I wanted something that could touch people in that way. The name "Olivia" harkens back to Sting's "Roxanne" and "Dance" because Obey is an amazing DJ. When the song’s played I want you to feel free to just dance at your own pace, even if you aren't that good, for a moment I want you to be able to dance your cares away. With everything negative going on in the world today, despite it all, we should just keep dancing and doing us. You work with a lot of forward-looking producers like Jansport J and now Obey City. Who would you say are the main musical influences on your blend of R&B and electronic sounds? I think the main thing about the music I make is that I’m very open to trying different sounds. I don’t like to be wed to one particular sound and enjoy making out of the box music that people can be like “I don’t know what genre to put this in, but I love it!” I have always had a particular love for old school jazz, Ethiopian music, and pop, but genre never makes a good song, the song is the one and only judge of that. Ella Fitzgerald, Teddy Afro, Michael Jackson and Mariah Carey have made great songs. Music that makes you feel something, that’s always what inspires me most. Genre can’t provide that. Pha The Phenom and I established the main stakes of my sound on the Canon series, my first work. My entire sound is a branch from those roots. Now working with Obey City, it’s a new frontier for me, a new canvas for me to play with more electronic and experimental sounds. Some say “Dance Olivia” sounds pop, other’s say experimental, I just know it’s pure beauty and, over Obey City’s backdrop, is exactly what I want to be saying at this point in my life. How would you describe the Mélat sound? Honest, raw, and human. It lies in an uncharted corner of the R&B scale snuggled closely with hip-hop, pop, rock, jazz, and Ethiopian music. It’s all of it and none of it at the same time. It’s amorphous but still consistent in it’s truth.